The Forest Preserve District of Kane County asks trail users to be aware of various tree-trimming projects, coordinated by ComEd this spring, that may briefly impact multi-regional trail systems. ComEd contractor Asplundh will trim trees along parts of the Fox River Trail, Illinois Prairie Path and Great Western Trail systems, as well as remove trapped and fast-growing trees underneath power lines. The Forest Preserve District asks trail users to be mindful of the possibility for construction traffic, machinery, and/or workers on our around the trails. Signs will be posted along the trails in both directions, leading up to project areas. While the trails will be kept open for majority of the work, it may become necessary to briefly close project areas. Illinois Prairie Path: Trimming began on the Batavia Spur on April 28 and takes place from South River Road/Illinois Route 25 east to Kate Court in Aurora. Trimming also began on the Aurora Branch on April 28, and takes place from Hankes Avenue north to Indian Trail Road east to Eola Road. Fox River Trail: Trimming will begin in South Elgin on May 5 and take place from LaFox Road/Illinois Route 31 south to Villa Maria Road. Trimming will also take place along the trail in North Aurora, from Illinois Route 56 south to Interstate 88, beginning June 9. The Forest Preserve District web site at www.kaneforest.com will post updates as tehy become available. 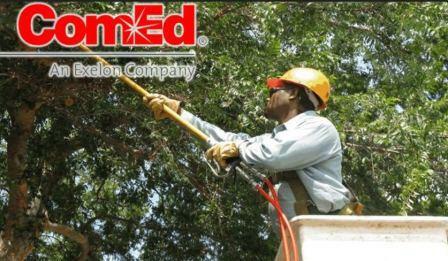 For more information on tree trimming, visit the ComEd website.